Sparkles make everything better! 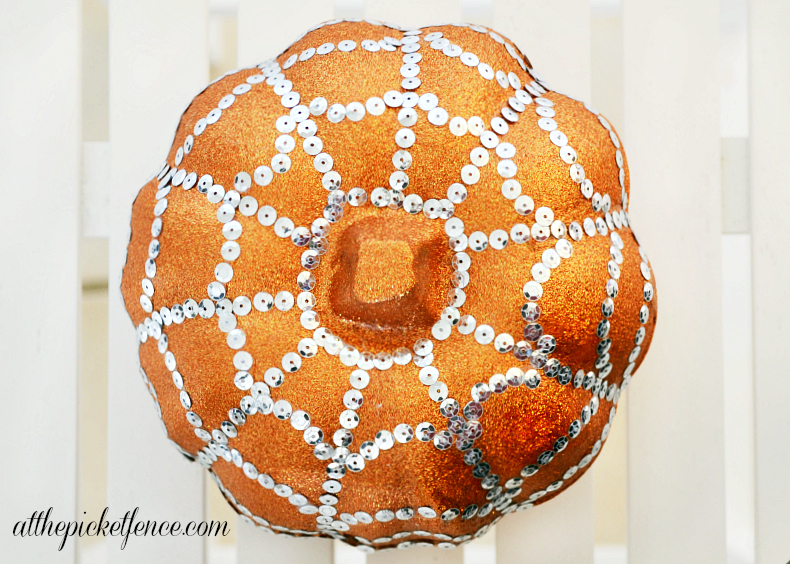 Spiderweb Blinged Out Pumpkin! I’m of the philosophy everything looks better with a little bling. I am a Southern gal after all, and we “really” love our bling! I think we all can agree that a little sparkle makes the world a better place. Having a bummer of a day…add sparkles! Haven’t had a chance to wash your hair all week…add sparkles! Experiencing some PMS water weight gain…yep…add sparkles! Sparkles make everything better, including cheap Dollar Tree pumpkins. Those sad little orange foam pumpkins with the line running around their middles, are so much happier with glitter and sequins on them! Just get yourself a pumpkin, orange glitter blast from Krylon, glue, a toothpick…and of course some sequins! Oh and don’t forget a really good movie for the two hours it will take you to hand apply the sparkles! 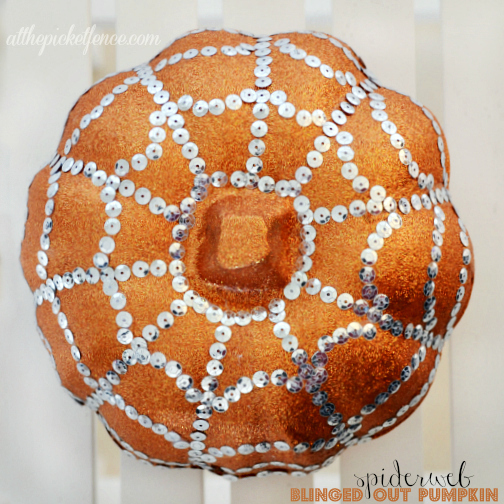 But it will be so worth it when you end up with a spiderweb blinged out pumpkin like this. Doesn’t this pumpkin look so happy and well…sparkly! 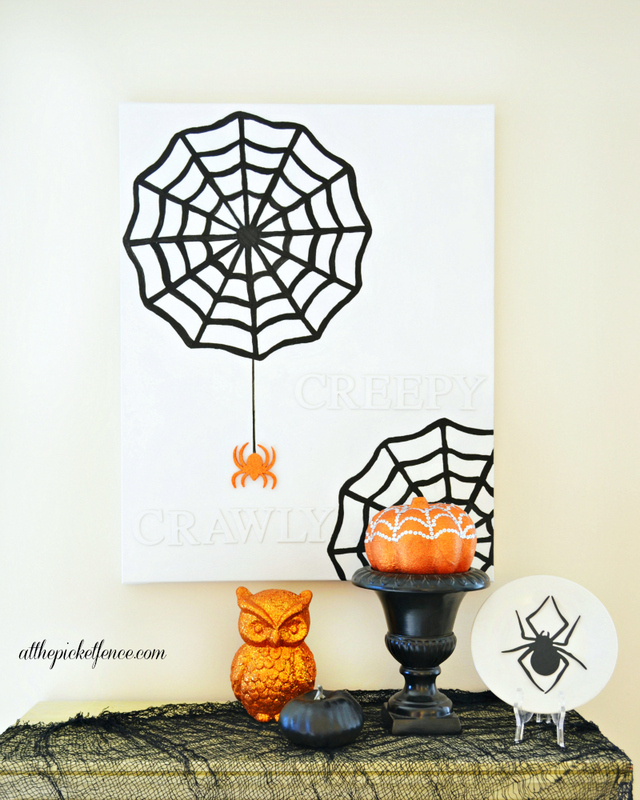 Did you see my other fun Krylon project, my Creepy Crawly Canvas? 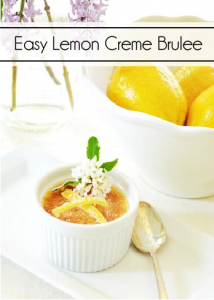 If not head over and check it out! Wishing you a sparkly day! 23 Comments on "Sparkles make everything better! Spiderweb Blinged Out Pumpkin!" Love it! 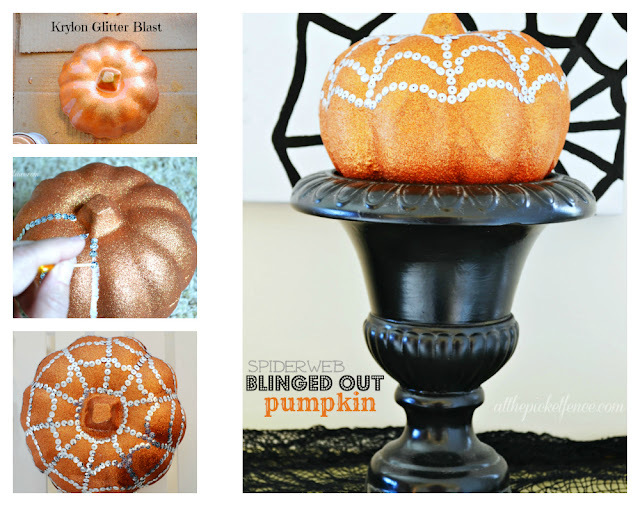 I just posted last night on “glammed” up pumpkins! I think I’m going to have to go back and include yours! Your pumpkin is super cute but I would never have the patience to spend 2 hours decorating it, whew! Wow Heather that is the prettiest pumpkin I have ever seen!!! I am a girl that loves some bling!You did a great job! That is a really fun way to detail a pumpkin! Love it! Glitter Blast, oh gosh, I LOVE this!!! Wow this pumpkin looks awesome! I really like how it turned out! 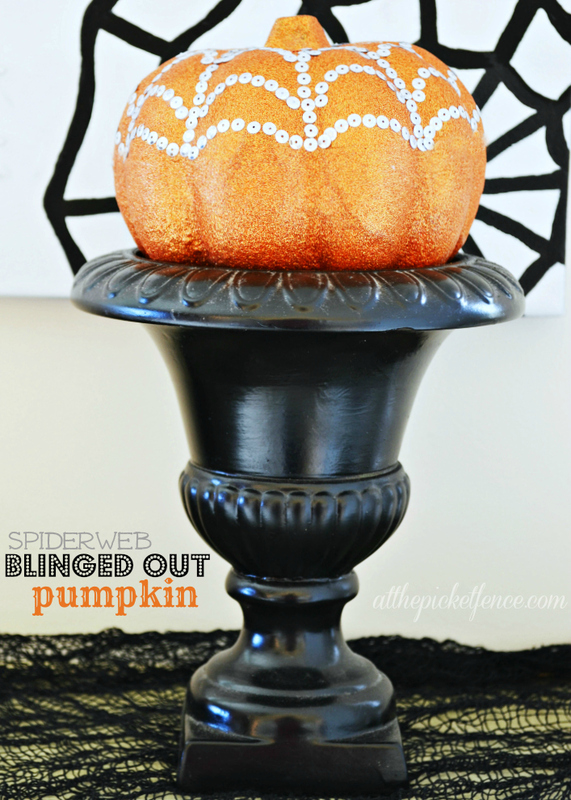 Really blingy and cute pumpkin. Looks so much better!! LOL … love the PMS excuse, Heather! I’ll use any excuse in the book to add bling! I love the pumpkin … and, the Halloween vignette is beautiful! I hope you all are having a stress-free move this weekend … you’ll love Georgia! Yes indeed Heather she sure does look pretty! Love those sparkles Heather, very cute. LOL! Love it! Even two hours of sequining is totally worth it! 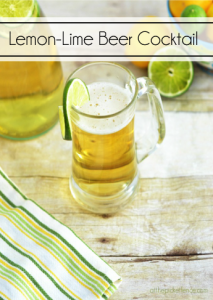 Another great idea for adding to the holiday. Fall has to be my favorite of all the seasons. 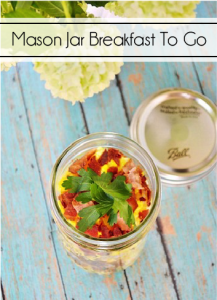 Thanks for sharing such a great idea. Heather!! Now THIS is how you do Halloween! Cutest thing ever! Sparkles really do make everything better. Super cute! You are always so clever. It’s adorable Heather! Love your Halloween vignette, and the canvas too.